Exquisite golf views & incredible entertainment home on ½ acre at 7871 Ironhorse Boulevard in Ironhorse. Circular drive, fountain & columns greet you to a showcase French-door entry. Saturnia inlay foyer & arches open onto volume ceiling & a free-flowing plan bringing in sensational light. Intimate enclave dining with plantation shutters, faux, and molded arches. The open gourmet kitchen has stainless steel & tons of granite counters for cooking & social gatherings. Built-ins & French doors highlight the family room. The master is oversized with hardwood, crown, walk-ins, and marble bath with bidet & Jacuzzi. No expense spared in the guest rooms & study. 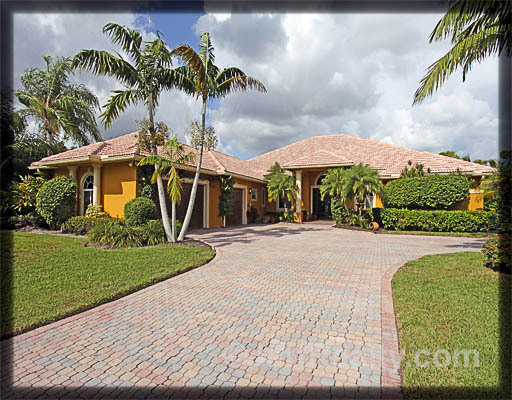 Ultimate in outdoor living with huge covered pine lanai & open screened patio that fits 60! Self-cleaning PebbleTek pool/spa. Walk to the club! Posted in Ironhorse, Ironhorse homes, Ironhorse homes for sale on October 11, 2011 at 3:17 am.